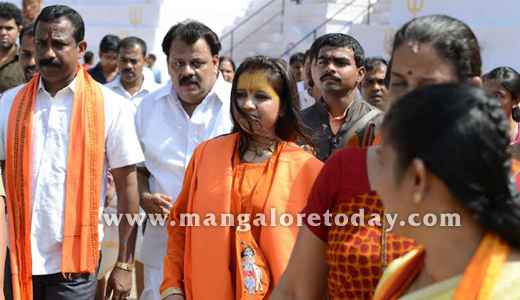 Mangaluru, March,01, 2015: When Hindus are converted no one speaks, but people are more alert when it comes to Ghar Wapsi, said Sadhvi Balika Saraswati. She was speaking to media men after offering prayers at the Sri Manjunatha Swami Temple at Kadri in the city on March 1, Sunday. Sadhvi Saraswati is to deliver the key note address at the Hindu Samajotsava today. 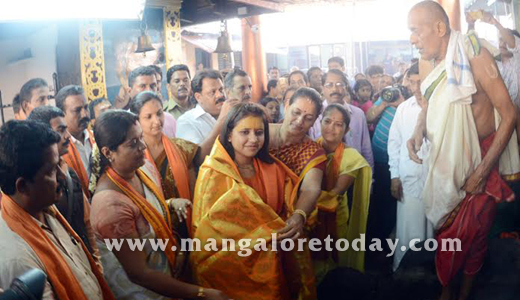 She had a word of praise for people of Dakshina Kannada and described them as deeply religious, polite and cultured. The Sadhvi also stated that Hindus should be alert on a variety of issues including Love Jehad, religious conversion and undue influence of Western culture on India. 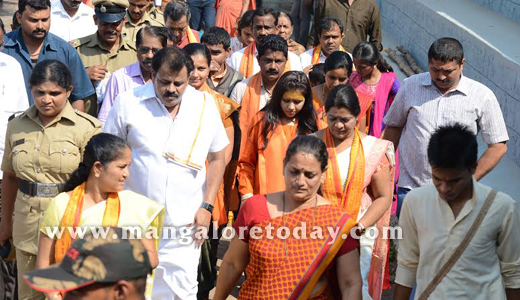 Konkodi Padmanabha, CAMPCO President and many VHP leaders were present.